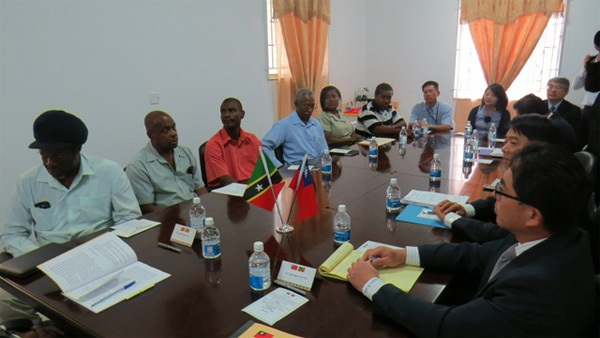 (CUOPM) – The Federation of St. Kitts and Nevis and the Republic of China (Taiwan) entered a new phase of cooperation in agriculture with an initiative aimed at vegetable, fruit and upland crop, quality and safety improvement. The Federation’s Minister of Agriculture, Sen. the Hon. Nigel Carty and Taiwan’s Resident Ambassador, His Excellency Miguel Tsao signed the Memorandum of Understanding (MOU) at the Taiwan Embassy on Friday morning. “Immediately we are going to embark on setting up two laboratories (1) for soil fertility analysis and the other for rapid detection of pesticide residue respectively and then start operating this project,” said Ambassador Tsao. He used the opportunity to underscore that a joint-venture model is applied to this project budget and personnel are supported and shared with by both Governments to the two laboratories. “I do believe the modus-operandi of joint-venture will sustainably bring this bilateral cooperative project to a new height,” said Ambassador Tsao, who recalled his remark on the recent handing-over ceremony of three demonstration farms in which he stated that the handing-over is not the end of cooperation, but another steppingstone and beginning of future endeavors,” said Ambassador Tsao. He said the three demonstration farms handed over are successful model of “from partnership to ownership” symbolizing a matured and well established agricultural development in St. Kitts and Nevis.